The Sacramento Fire Department’s two boat patrols are set to be eliminated due to budget cuts in mid-July. In the past five days, we’ve rescued 53 people and two dogs on the American River,” said Sac Metro spokesman Dale Turner. Due to heavy winter snow, the American River is running unusually high and fast for this time of year. Emergency crews are warning that the conditions are dangerous even for experienced swimmers. Sacramento City Fire officials confirm that the boat patrol program will be eliminated on July 16. High, cold water on the American River brought several more rescues Wednesday, including one group of 20 rafters who had to be rescued when their rafts foundered near Riverbend Park. “We got hung up right in the middle between a really big current and I don’t know, but the raft popped and it flipped over,” Benjamin Gabriel of Lincoln said. As fire rescue boats raced to pull people out, Gabriel said he was barely able to make out of the freezing, fast water. Sacramento Metro Firefighters on the swift water rescue team have been very busy. Firefighters said they made 28 rescues between Monday and Tuesday along the American River alone. Because of he recent activity, Sac Metro, Sacramento City, and the Folsom Fire Department are all teaming up for “Operation River Safe”.”We are putting six boats and more than twenty trained firefighters on the American River to be in position to respond to water emergencies. With the conditions, it’s a matter of if, not when,” said Sacramento Metro Fire’s Pat Ellis.Triple-digit heat and abnormally high water flows have combined for a very dangerous situation. Nearly two dozen students were the subject of a massive rescue effort on the American River after their rafts became tangled on a portion of the Howe Avenue bridge. Five fire engines, 3 boats, 4 medics and 2 helicopters assisted in getting the group to shore safely. Crews were able to save everyone in the group. The hot weather makes jumping into the American River sound like a great way to cool off. But Sacramento County park rangers say sierra snowmelt is making river conditions far too dangerous. They’re urging people to stay out of the water. A controversial federal policy that could require millions of trees to be cut down on Central Valley levees is the target of a lawsuit. Three environmental groups filed suit against the U.S. Army Corps of Engineers on Monday in federal court in Sacramento. The Army Corps sets national standards for levee safety. In 2007 it unveiled a revised maintenance policy that forbids trees or shrubs on levees. Instead, only short grass is allowed on levees and within 15 feet on either side. The policy raises significant concerns in California, where levee vegetation composes much of the remaining 5 percent of the Central Valley’s historic riparian forest. As such, it is crucial shade and habitat for migrating endangered fish, as well as nesting habitat for many endangered birds. Other plaintiffs are Defenders of Wildlife and the Center for Biological Diversity. The plaintiffs allege the Army Corps policy violates the Endangered Species Act, because the agency did not consult with federal wildlife agencies; and the National Environmental Policy Act, because it didn’t prepare an environmental study. Army Corps spokesman Pete Pierce declined to comment on the lawsuit. The policy has not yet been carried out in the Central Valley. State and local agencies struck a deal with the Army Corps to delay it until next year while they work out a compromise. The Corps also created a process for local agencies to obtain exemptions so trees can remain. However, this may require costly levee redesigns. The potential removal of thousands of trees in the Sacramento area alarms many residents who value their shade and scenery, particularly along the American River Parkway. Sacramento Metropolitan firefighters rescued nearly 30 stranded rafters along the American River in just the past three days. The reason? The fast flowing American River is shoving rafts into trees, now under water, and popping the rafts like party balloons. “People are just blatantly running the risk of killing themselves,” said Ingall. Snowmelt causing American River water levels to rise forces Sacramento County officials to close boat launch access near Sunrise Boulevard. The increasing water levels along the American River are totaling more than 12,000 cubic feet per second (CFS), according to the California Bureau of Reclamation. River rescue authorities continue to urge those partaking in river activities to use caution if they decide to get in the water at all. There’s nothing to it, really. They get on their specially made bike, with their helmets, sunglasses and matching jerseys, and then they go, riding together mile after mile, the faster and farther the better. Dad, who is 59, pedals smoothly and efficiently while going 20 mph or more. His 30-year-old son sits in front on a custom-made seat, as if on a throne, smiling as the wind washes over his face. When he hears his father grunt and groan going up an especially steep hill, he bursts out laughing. When the bike goes fast – they have topped 60 mph going down hills – the happiness races with it. 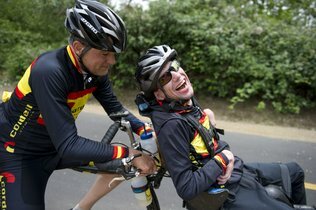 In 1992, Don Webb gave up competitive distance running and began looking for a new activity that he could do with his son Dustin, who was born with cerebral palsy, has never walked and taps out messages on a specialized computer to “talk” to his family. In the nearly 20 years since, father and son have traveled an estimated 70,000 miles. It’s a different world once the bike gets moving. All of the challenges of everyday life – with eating and getting dressed and figuring out how to express oneself the easiest and best way – are behind them. Ahead is the simplest way of looking at life. You point. You pedal. You breathe. You move. And you just keep going. On Father’s Day, when so many people are celebrating or taking stock, this father and son possibly hold the secret to happiness: Those challenges and heartbreaks and shortcomings everyone else sees are actually opportunities. No one in the Webb family has ever dwelled on Dustin’s physical disabilities or used them as an excuse. Don Webb’s two able-bodied daughters, both older than Dustin, have watched their father and their brother take to the bike with a special passion and devotion, embracing the simple joy of a ride. Don and Anne Webb, who have been married 37 years, moved to Sacramento with Dustin two years ago. Don credits his wife with being the primary advocate for their only son, from the time he was born, through the school years and now, well into adulthood. When Dustin’s not on the bike with his father, he listens to audio books. He’s a jazz aficionado and major sports fan – following professional bike racing and rooting for the San Francisco Giants and Duke University basketball team. His sisters, both married with children, also live in Sacramento. Don Webb owns a thriving project management company, Cordell Corp., which oversees the development of large sports, entertainment and cultural facilities. Among the company’s successes is Raley Field in West Sacramento. He figures he rides 7,000 miles annually, about half it with Dustin. Since their arrival in town, father and son have become a familiar presence on the American River bike trail and on roadways throughout the region. To see them for the first time is to be moved in ways powerful and immediate, with the 75-pound Dustin strapped in a harness and often beaming as his dad powers the bike forward. Sacramento Metro Fire water rescue teams were dispatched to the report of two people, a 38-year old female and a 10-year old male, stranded in shallow water on the high-flowing American River. Fire crews quickly responded to the area and found the two standing in shallow, swift-moving water. They were assisted into the rescue boat and returned uninjured to shore. The pair said they were part of a three-raft flotilla, all tied together, when the raft’s tie rope became entangled in a bridge abutment and they had to cut free. Once freed, the raft soon became caught in tree branches downriver, which they clung to fighting the strong current. They abandoned their boat and made it to shallow water; while their friends called 9-1-1 for help.